October is done and November has begun. There is no official color for the last two months as they are a time for catching up, wrapping up and finishing up. Feel free to fill in though if you need more blocks, more colors or to use more scraps. I'm off to a late start today. I should have hit "post" before I left for my run, and it was 9 miles this morning, so that can get long when you run as slow as I do. The weather was beautiful today, cool, with a hint of fall in the air. That doesn't happen often in Florida so it is nice to have a change of pace. I plan to add a border to Square Away today. I think it would look fabulous with an applique border. I always think quilts would look better with an applique border. Maybe a simpler border would make the quilt get done quicker though? I'm thinking of hand quilting this one, so quicker isn't really part of the plan. 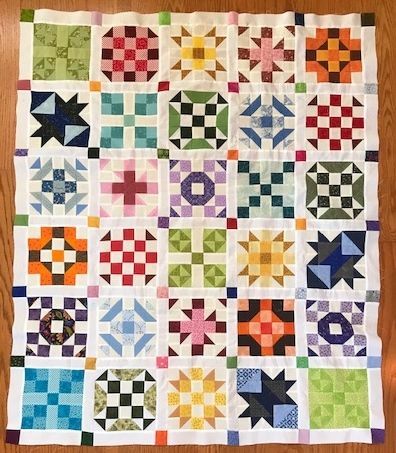 Your Squared Away quilt is so pretty with the way you did the sashing and cornerstones! I know mine will need a border, so I'll be interested in seeing how you do yours. An appliqued border sounds pretty! I love your squared away quilt! Awesome RSC quilt. I really like your version of Squared Away. It's been a really fun project this year. 9 miles? I'd still be waiting for the cab to come pick me up!! ha ha! Great job, and I like your layout too - they are all so neat! Your sampler quilt looks terrific! I look forward to getting some time to work on mine! I have all my blocks made. Now for the sashing.